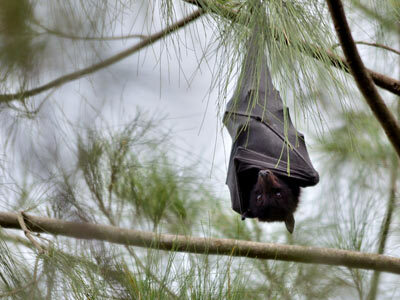 Researchers who tested urine samples collected from beneath bat roosts in eastern Australia for Hendra virus found higher levels in samples from the traditional disease hotspots around southern Queensland and northern New South Wales. The dangerous pathogen was more common under roosts where black or spectacled flying-foxes were present, adding to growing evidence that these species were the main carriers. Hendra virus, first identified in 1994, causes highly lethal disease in horses and humans. Pteropid bats – the native fruit bats known as flying-foxes – are the recognised natural reservoir for the virus. The research team sought to identify key regional and time-related factors associated with excretion of the virus. Their study covered a 2300km swathe from north to south, from northern Queensland to southern New South Wales. It encompassed all known locations of the disease in horses. Dr Hume Field and his colleagues set up equipment that enabled them to gather monthly pooled urine samples from under roosting flying-foxes over a three-year period. They screened the collected samples for the virus. In all, a total of 14,988 pooled urine samples were collected from beneath 50 roosts. They found that excretion levels of the virus were moderate in northern and central Queensland, highest in southern Queensland and northern New South Wales, moderate in central New South Wales, and negligible in southern New South Wales. The highest levels of virus detected occurred where black or spectacled flying-foxes were present, the research team reported in the peer-reviewed open-access journal, PLOS ONE. Very little or no evidence of the virus was found under roosts inhabited exclusively by grey-headed flying-foxes. “Similarly, little red flying-foxes are evidently not a significant source of virus, as their periodic extreme increase in numbers at some roosts was not associated with any concurrent increase in Hendra virus detection,” they reported. Evidence from the three years of monitoring showed consistently higher excretion of the virus over winter in southern Queensland, northern New South Wales, and central New South Wales. The researchers said their findings allowed risk management strategies to be refined and targeted. They said the study had advanced the understanding of the dynamics of Hendra virus infection in flying-foxes and improved the understanding of the fundamental drivers for spillover of the virus to horses, and indirectly to humans. The findings also provided supporting evidence that black and spectacled flying-foxes were more likely to be associated with Hendra virus excretion than other species. These findings were consistent with the observed regional and seasonal pattern of infection in horses, they said. They showed that the prevalence of Hendra virus infection in flying-foxes was a fundamental determinant of infection in horses. Field was joined in the research by David Jordan, Daniel Edson, Stephen Morris, Debra Melville, Kerryn Parry-Jones, Alice Broos, Anja Divljan, Lee McMichael, Rodney Davis, Nina Kung, Peter Kirkland and Craig Smith. The research was published under a Creative Commons License.